Assam SLET Syllabus 2019 (असम एसएलईटी पाठ्यक्रम- एसईटी परीक्षा पैटर्न, पिछले साल प्रश्न पत्र): The State Level Eligibility Test Commission Assam (NE Region) conducts the State Eligibility Test (SET) to select the eligible candidates for Lectureship/Assistant Professor jobs 2019. All the eligible & interested candidates register for Assam Lecturership Recruitment from 12th December to 10th January 2019. Applicants can have the SLET 2019 on 03rd March 2019 on various exam centers around the state. 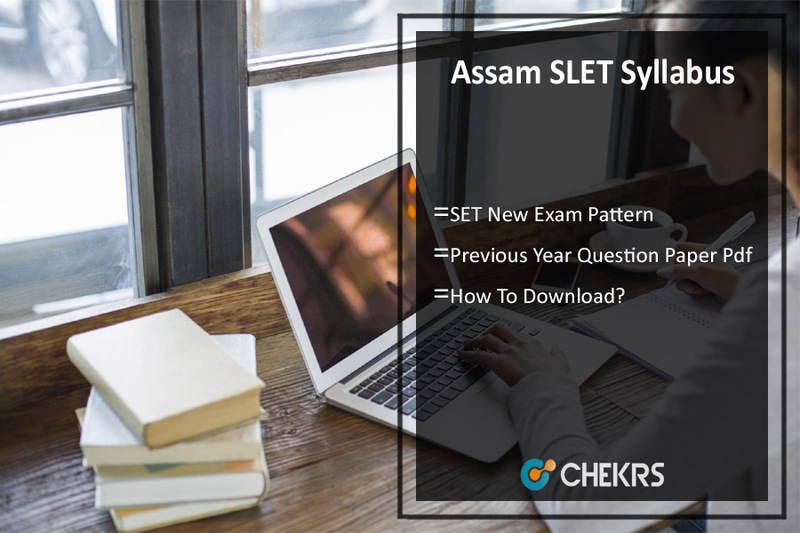 The details of Assam SLET 2019 Exam Pattern & syllabus pdf are available in the article below. Every year a large number of contenders registering for the Assam Assistant Professor Jobs 2019 candidates need to prepare well for the exam by using the Assam SET Syllabus, exam pattern, previous year question papers & others. We provide a link to check Assam SLET Question Papers from the official site. Candidates going to appear for the exam need to get Assam SLET Admit Card from the website. The release date of admit card, Assam SLET Preparation Tips & other valuable info has given below. In the North East region candidates willing to pursue the job of a lecturer, it is mandatory for them to qualify the exam of SLET i.e State-level Eligibility Test also known as SET. The exam date has been notified already and now the State Level Eligibility Test Syllabus is also provided. The exam is scheduled for 03rd March 2019. The competition level of the exam is usually high and the candidates will have to ensure a good preparation. To help the preparation, here we are providing previous year question papers, exam pattern and the direct links to download the Assam SET 2019 Syllabus. The North East State Level Eligibility Test Exam Pattern will be very crucial for all. Along with the syllabus, a practice for best performance in reviewing exam pattern will be important. Open the official website link provided above. Click on the link of syllabus available in the left of the home screen. List of all the subjects will appear on the screen. Choose your subjects and click on the link. A new tab will open containing the pdf. To ease the efforts in the table below we have mentioned direct links to the pdf files of all the subjects. By clicking on them the link next to the subject can directly get the official Assam SET Syllabus 2019. The previous papers of any exam will prove to be a great help for all those who seek to analyze the difficulty level of the exam. The candidate who wants to take such help is notified that the Assam SLET Model Question Papers Pdf will be a good resource for them. The previous papers will help the candidates to understand the exam pattern and get an idea of the speed required for the time allotted. To receive more updates on Assam SLET, keep visiting our site www.jobs.chekrs.com. In case of any query or review place about Assam SLET 2019 Syllabus, your valuable comment in the commenting section below and our team will revert you in a short while.